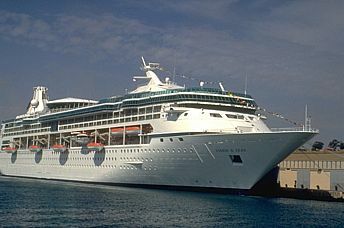 The majestic Vision of the Seas berthed in Malta Harbor. Saturday: Barcelona, Spain. Brilliant sunshine. Check on board ship. Hustle to Las Ramblas for alfresco lunch: spicy paella under a shady umbrella. Picasso museum: historic building, enigmatic mix of exciting and drab works. Tiny gallery across alley sells gorgeous glass art. Antoni Gaudi's architecture: resplendently gaudy. Down by bay, the Vision is, well, a splendid vision, towering over other ships. Like my notes say, it's taller than Niagara Falls, twice as wide as the London Bridge, and as long as the Eiffel Tower is high. 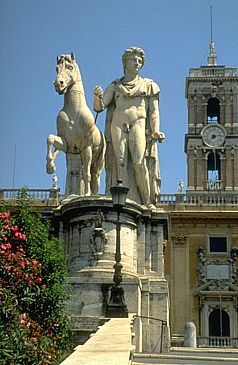 the entrance to Rome’s Capitoline. Exploring inside, I find passengers oohing and aahing over the ship's atrium lobby and pool. Gym is top-notch: bikes and treadmills have exciting video "tracks" and the jogging track is good and uninterrupted. Spa gals tout an amazing electro-shock therapy "guarantied to knock off inches." Dress code tonight is casual. Ken wears a sports-jacket, many other men, jeans and T-shirts. Dinner is delicious sea bass. Skip variety show for romantic piano bar. Sleep easy on smooth sailing across the Mediterranean. Sunday: Villefranche, France. Blue sky over Cote d'azur. Market in Vieux Nice brimming with voluptuous fruits and flowers, real and marzipan. Lunch in Eze overlooking sea. Met a young family from ship here - it's their fourth Royal Caribbean International cruise with their parents and three children who "love the kids' program." Stroll around Monaco Palace and gardens. Cafe au lait while watching ritzy crowd at Monte Carlo. Back on Vision for relaxing swim. Dinner: tender beef. Skip comedian for piano bar. Monday: Ajaccio, Corsica. Sparkling sunshine. Thrilled - in spite of long, roller-coaster bus ride - to see Les Calanches. This spectacular range of red granite mountains soaring above crystal clear waters is a UNESCO World Heritage site. Met a couple of hip grad students, late 20's, on their first trip to Europe: they "love the whole Vision scene." Befriend two 40-ish couples who say this is their "dream cruise." Formal night. Captain's Gala. Ken in tux. Most men in suits. Rich menu: caviar, fancy seafood. My fish is bland. Tuesday: Civitavecchia, Italy. Sunny. 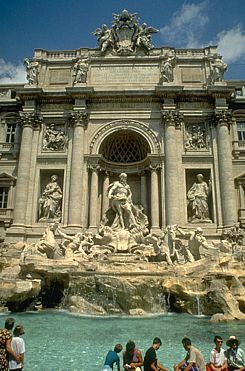 The Vision's Eternal City Tour to the Vatican, Sistine Chapel, Coliseum, Forum - a dream come true for first timers. 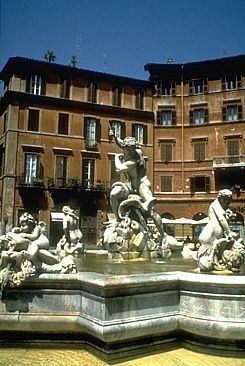 We head for Via Condotti, the old Jewish ghetto. Pasta at Tre Scalini overlooking Bernini's fountains. At the cocktail dance, people rave about the ship, the itinerary, the food. Entertainment is RCI's Rock on Broadway, a peppy and fun rendition of great hits. Wednesday Messina, Sicily. Sunny. 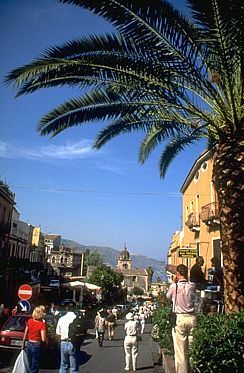 Drive to Taormina, the 18th century town known for its ancient amphitheater and ceramic crafts. Have a frosty gelato and buy a pretty plate. Return to the Vision for a decadent day on deck. Entertainment is Coasters of Yakety Yak fame, who put on terrific show, but the European and Russian passengers don't get it and walk out. Thursday: Valletta, Malta. Sunny. Forego another peek at Caravaggio's masterpiece for a sail around Valletta's historic harbor. After, a lovely sun-kissed day on deck. Friday: at sea. Drizzly. Everyone indoors. Heard the food demo, bingo, art auction, and horse racing were packed. Shmoozing at dinner: our tablemates "loved" this cruise. So, having experienced the world's finest cruise ships, how do I peg my review of the Vision while under the influence of this perfectly delightful Mediterranean itinerary? Les Calanches is a UNESCO World Heritage site. 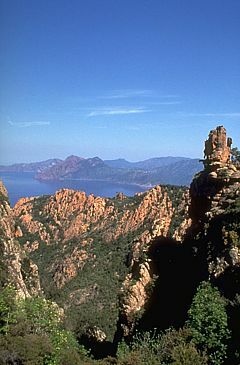 The spectacular range of red granite mountains soar above crystal clear waters. Take this Vision of the Seas, the $275 million (US), 2,435 passenger, 78,491 ton, mega-ship launched by Royal Caribbean International in May 1998. Its publicity pitch - "like no vacation on earth" - aims squarely at "active travelers looking for an affordable, cost-effective vacation that's fun, relaxing and refined." In other words, dare I say, middle-America. In that context, the hype is true. The reality is the Vision of the Seas is a meticulously conceived statement of design, service and amenity. The Vision wows passengers with its public areas: the soaring atrium lobby with its glass enclosed elevators; vast swaths of windows that meld exterior views with gleaming natural wood interiors, sumptuous furnishings in tapestry and soft leather; the two-story theatre with its lavish masquerade-inspired curtain; the kaleidoscopic jolt of the casino; the glass-ceilinged solarium with its indoor pool; the big outdoor pool with its shaded, twin tandem whirlpools. However, "cost-effective" defines the level of service and amenities. The staterooms are pleasant, roomy enough, immaculately clean. You must upgrade for a bathtub, bar fridge or balcony. Bring or buy a hairblower. And forget complimentary, in-room goodies. Fees apply for fruit, coffee, pop, bottled water - never mind caviar and champagne. While food is free in a generous cycle of meals and snacks, drinks are not. So passengers pony up a couple of bucks a quaff for an endless stream of drinks, most with cute paper umbrellas and souvenir glasses. Apparently, RCI pegs its moderately-upscale passengers well, since the company is booming full sail ahead. Since 1988, when RCI launched Sovereign of the Seas, at that time the world's largest cruise ship, each of its new ships boasted improvements. The Vision has the biggest space ratio, the biggest spa, the best youth clubs (supervised by professionally trained teachers). 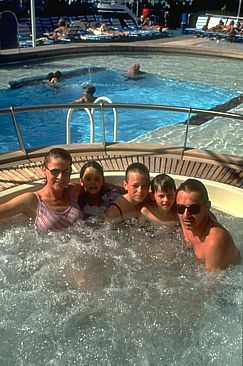 In June 1997, RCI (owned by Anders Wilhelmsem & Co and the Pritzker family of Chicago, who also have a controlling interest in Hyatt Hotels) bought and merged with the posh Celebrity Cruises. In November 1999, RCI launched the latest "world's largest cruise ship", the $500 million (US), 136,000 ton Voyager of the Seas, the first of the three "Eagle-class" mega-liners. My thoughts? The creators had perfect vision. The Vision of the Seas is a beautiful ship, perfectly suited to its target passengers. Royal Caribbean International, 1050 Caribbean Way, Miami, FL 33132. RCI is the official cruise line of the Professional Golfers Association. Passengers on the "Golf Ahoy Program" may play at top clubs around the world.